They say everything is bigger in Texas, and that’s definitely true of ISTE in San Antonio. I have been to Ed Tech conferences before, but none with 20,000 people from 70 countries, all in one place for one thing: to get inspiration and ideas on how we can improve education through the creative use of technology. And there were a lot of ideas and even more inspiration to be shared. A few stood out for me. 1. Jane McGonigal, a keynote speaker, truly won me over to gaming with her inspirational speech about how gaming can improve the world. She talked about how gamers experience positive feelings in every game that are in short supply in the real world. Hence the name of her book, Reality is Broken, which I immediately purchased and devoured on the flight home. Her thesis is that if we take the 1 billion gamers in the world and set them loose on games that can positively impact our real world, we can change the world. I signed up for ChoreWars as soon as I got home, a game she highlighted in her talk, and though it hasn’t changed the world, it has certainly changed the cleanliness of my home. 2. 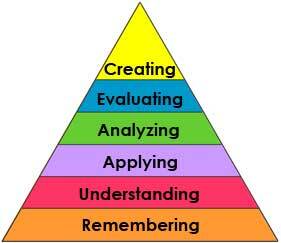 My second big takeaway has to do with the tip top of Bloom’s (revised) taxonomy, that golden triangle of creativity crowning the pyramid. We all want our students to reach the highest levels of thinking, but as we design our lessons and projects using tech, we need to clearly differentiate between creativity with the tools versus creativity with the content. If students are learning about the concept of “justice,” for example, and they create an amazing video about the concept, is that reaching Bloom’s highest level? Only if they clearly show creativity with their THINKING. Is it original thought? Have they applied it to their own experiences? Have they combined concepts in a new way? Have they used their research to predict something new? Check out the presentation at www.tinyurl.com/createlevels. Trend 1: Big data: big data is coming to education. What will that mean? It will mean that our students will have no anonymity. It will mean that everything about our students will be available to big companies who will market to them specifically. Ohler says make sure we teach our students to steer the data, not let the data steer us. Make our students in control of what kind of data they’re creating. Trend 2: Immersive reality--the 2-way cloud. Immersive reality is nearly here. It will combine what we see with where we are, merging digital reality with real life. The Internet of things is nearly upon us. Think Google Glasses. Trend 3: Semantic web: The web is being rewritten so machines can talk to each other better. Everything will have a tag and an ip address, and everything will be so interconnected that the internet will become one big suggestion box that offers suggestions uniquely to each user. Trend 4: Extreme byod: digital devices won’t just be computers, phones and tablets. They’ll be wearable tech, google glasses, robots, headgear that help you focus, and more. Blended learning ideas from Kristin Kipp at www.educationfrontier.org.